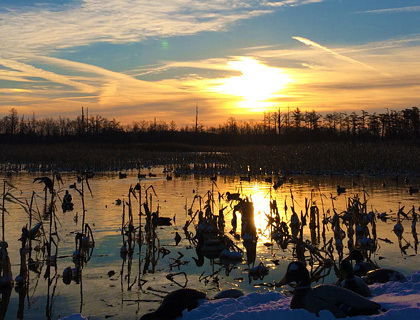 A very limited number of annual waterfowl memberships are available each season. We greatly restrict the number of memberships to ensure quality hunts for all of our guest and members. Memberships are offered to previous members first, but then open on a first come first serve basis. We cap the number of annual members at 5 per year, so don’t delay in contacting us, they sell out fast! Deer and Turkey hunting privileges are held exclusively for club partners. NO annual memberships are available. Please contact us on partnership pricing. Only 1 Remaining! Partnerships are available from time to time. Please contact us if you would be interested in further information on the club or becoming a partner in this amazing property! We currently have partners spanning from Indianapolis, IN to Atlanta, GA. For serious applicants, a tour of the property can be arranged or a complimentary hunt to show you what this club is all about! At the time of the request, if no shares are available, you will be placed on our waiting list.